On September 20th the National Endowment for the Arts held a public webcast to release and discuss its new report How Art Works. How Art Works lays the groundwork for the NEA’s new five-year agenda and uses a “system map” to outline the relationship between art and social well-being. The map was developed by the NEA through the collaboration of researchers and individuals engaged in the arts. The NEA’s agenda focuses on analyzing individual, social, community, and economic benefits of arts engagement. At the heart of the report is the concept that engagement in art will improve the quality of life for the individual as well as the community. According to the report, the interactions among individuals that art inspires are vital in order to see any benefits produced. 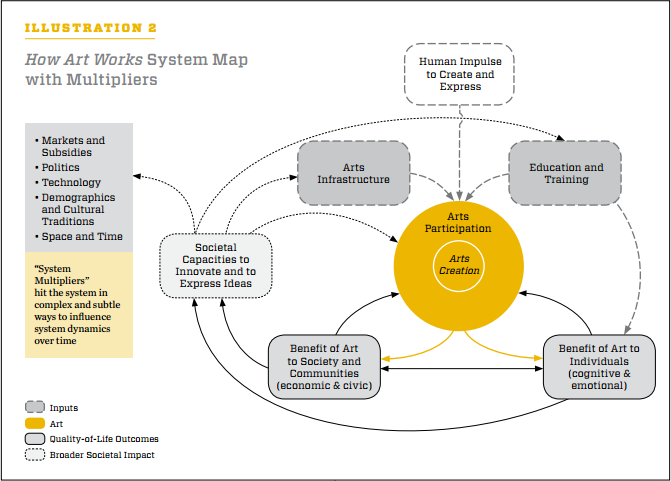 The map showcases “How Art Works” by displaying specific “inputs” and “outputs” from art engagement that make up the beneficial cycle. The inputs are 1) art education and training, 2) the human impulse to create and express, and 3) arts infrastructures (such as the institutions that encourage the creation and intake of art). The outputs are 1) benefits to the individual and 2) benefits to the society and community from art. The map will be used by the NEA in their new agenda to provide a framework and questions for future research projects. The map is also expected to fill in research gaps that have existed by creating a clear visual of the impact relationship of art engagement on the individual and community quality of life. One of the large topics discussed in the webcast was the possible impact the map and future research could pose on funding for arts engagement. In a quantitative world, the NEA’s use of the map as a tool to further research that aims to “prove” the benefits of arts engagement could become highly beneficial for art practitioners seeking funding. The full NEA report can be found here.